Question: What are the ten Sefirot? Answer: The foundation of the universe is Light, not visible light, but a special energy that spreads, emanates, creates, fills, and changes everything. In its primordial state, it is called Keter (crown). Spreading downward from above, the Light creates a point: a desire that begins to grow under its influence. From the zero state, where the point represents simply a property of the Light, it changes to the first state and begins to sense what it desires. This first expansion of desire is called Hochma. In the second stage, the desire, under the influence of the Light, is transformed into its opposite property—the property of Bina. It also desires, but only to give. The desire begins to perceive the properties of the Light (bestowal), and becomes similar to it, like a child relative to an adult when he perceives the adult’s qualities, habits, and views. The third stage is Bina’s desire to be similar to Keter. 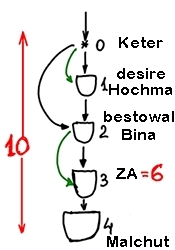 Since Keter created the property of Hochma, Bina also generates the next property, Zeir Anpin (ZA), which in Aramaic means small face. Small because it does not come from Keter but from similarity to it. Then the desire acquires the aspiration to receive more: the entire enormous Light that comes from the zero stage. This is the fourth stage or Malchut from the word “kingdom”—the kingdom of desire. In addition to these four parts that exist in nature, nothing else was created. The whole universe, the planets, the inner parts of man, our psychology, the mind, any system, whatever we name consists of these parts and their hierarchy. Zeir Anpin, in its turn, consists of six parts. Thus, the entire creation represents ten parts, or ten Sefirot. Sefira, from the word “luminous,” is a luminescence of a certain property. Each Sefira is a whole system of interacting forces.